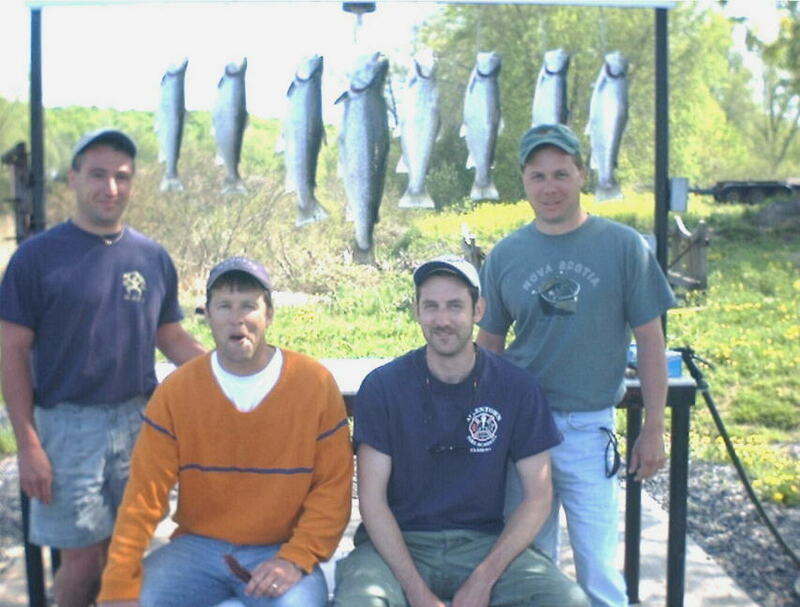 Well Spring fishing has begun for the year 2000. A few months ago we were all wondering what the Y2K bug might bring? Now life is back to normal and so is the fishing. Click on the Thumbnail to see this nice spring brown. Don't forget to use the back button on your browser to return here! Marlene and Frank Zanetell of Gunnison, Colorado get the award for the longest distance traveled for a charter this year. While at Cornell University attending graduation their daughter Brooke, Nancy Sherrod (of OHIO), Tania Schusler (a Grad student at the university) booked a charter as a new adventure not knowing what to expect. The group had a great day as you can see from the photos. All were in agreement, This was a great day! Not only will they never say "I've never done this before" but now the girls can go back and teach the boys one more thing they can do better. 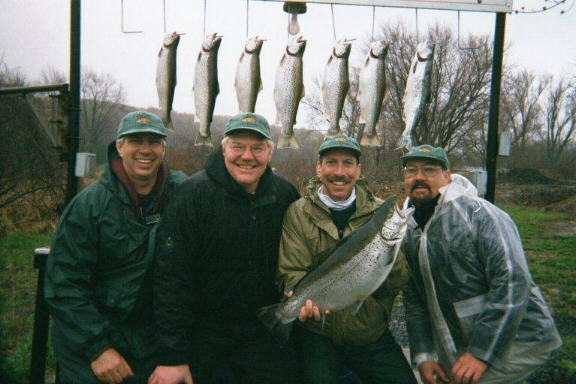 Joe Stagon, Ted Paszek, Bob Hinkle, Lewis Shepard (From left to Right.) 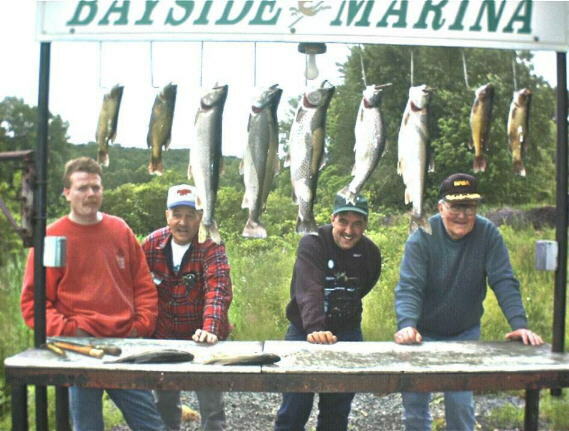 The opening weekend of BASS went very well for the group from Connecticut. 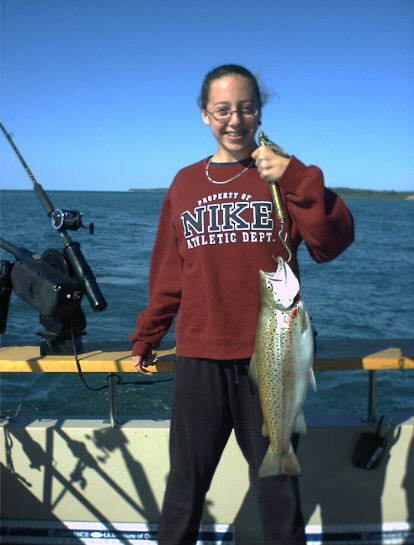 The Fathers Day trip was rewarded with a combination of Bass, Brown Trout, and Lake Trout on the first day. The change in weather on the second day lead to less active Brown Trout, so we moved in closer to shore in an attempt to catch more bass. 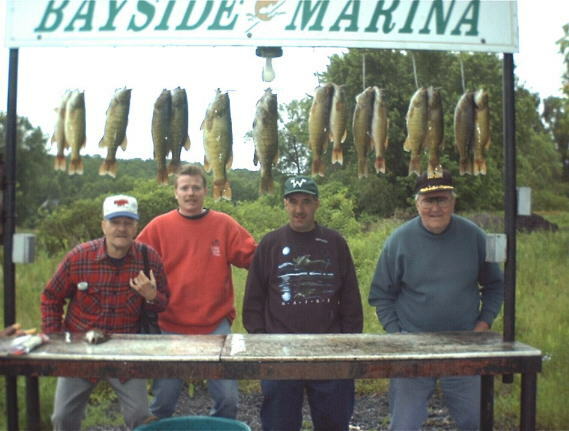 In TWO HOURS we had a LIMIT catch of Bass, many in the 3 pound range!!! Danielle Krommes stopped by and signed our guest book "we just want to tell you that we had a great time this year. We are planning to fish with you many more years. 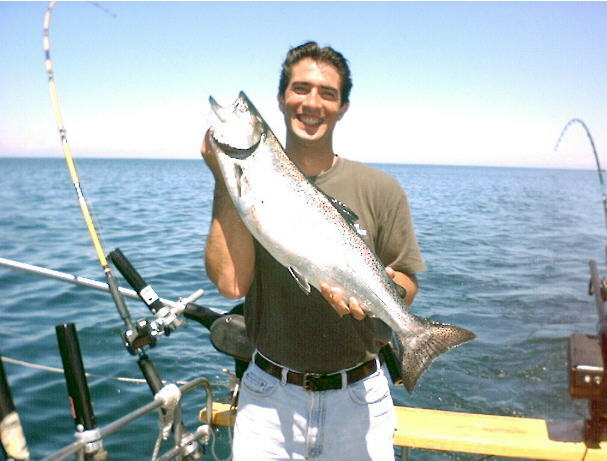 You provided us with a great experience... See you next June..."
Nabeel Chihadea originally from Seria with his first salmon! 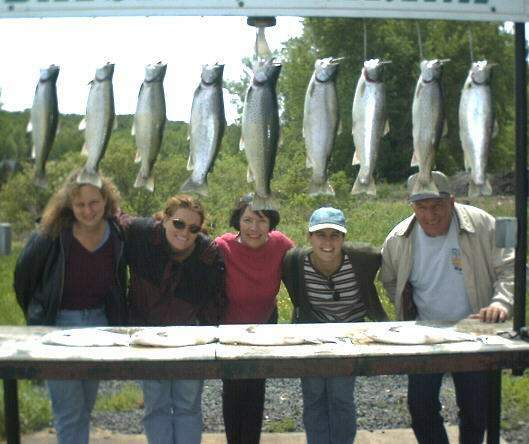 He was a guest of his father-in-law and fished with his brother-in-laws he is now a resident of Edison NJ. 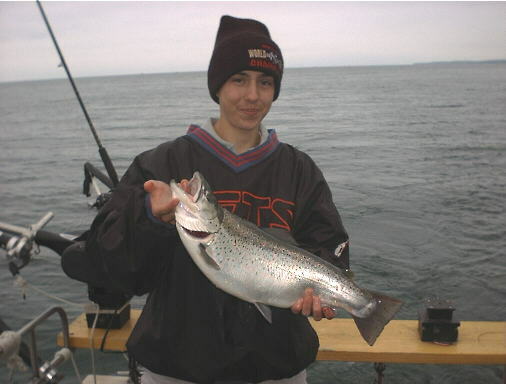 This was my first of which will be many trips w/ Clyde and Fantasy Charters. Clyde is a great host and captain! 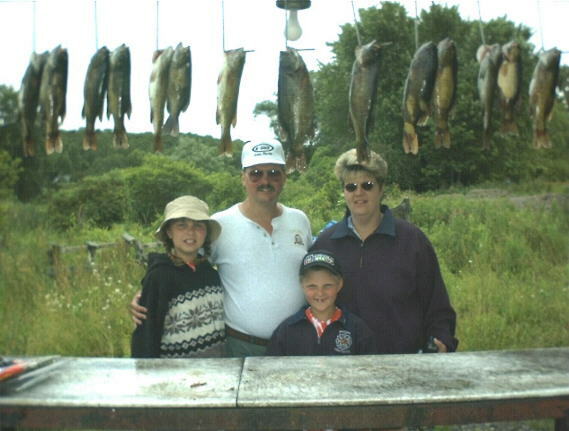 From the time we arrived at the lodge until the time we left after fishing, he took real good care of us! 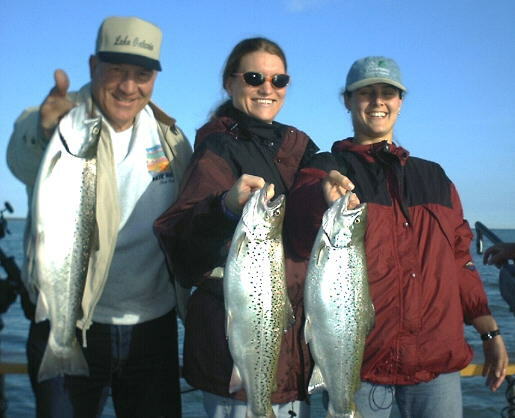 I highly recommend Fantasy Charters for some great fishing!! 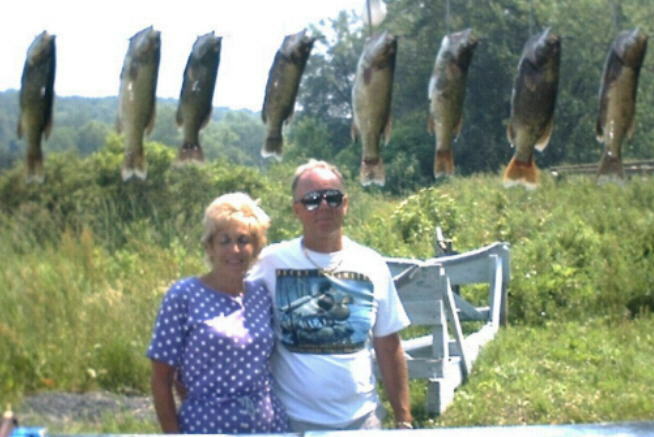 Bob and Marcia Ingersoll of Las Vegas, Nevada get the 2001 award for the longest distance traveled for a bass charter. They got their "limit" of bass on the trip to New York. Happy 50th Birthday Dad! 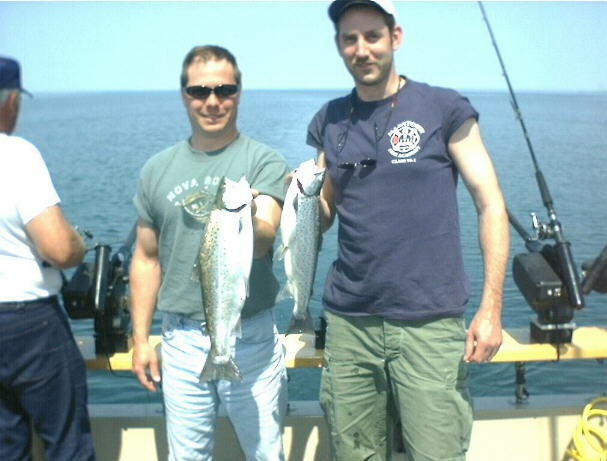 Anthony brings his dad out fishing for a 50th birthday present. We think it was a good present, and a good day. 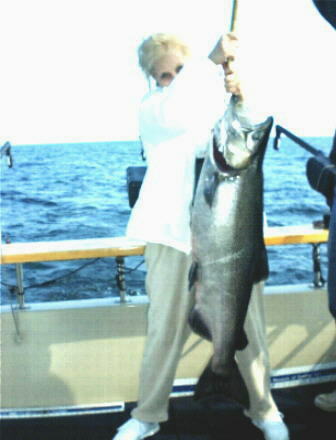 This fish was the leading salmon in the women's division of the fall derby at the time of the photo. Too bad for Charlotte she didn't win, but the fish was definitely a nice consolation prize. 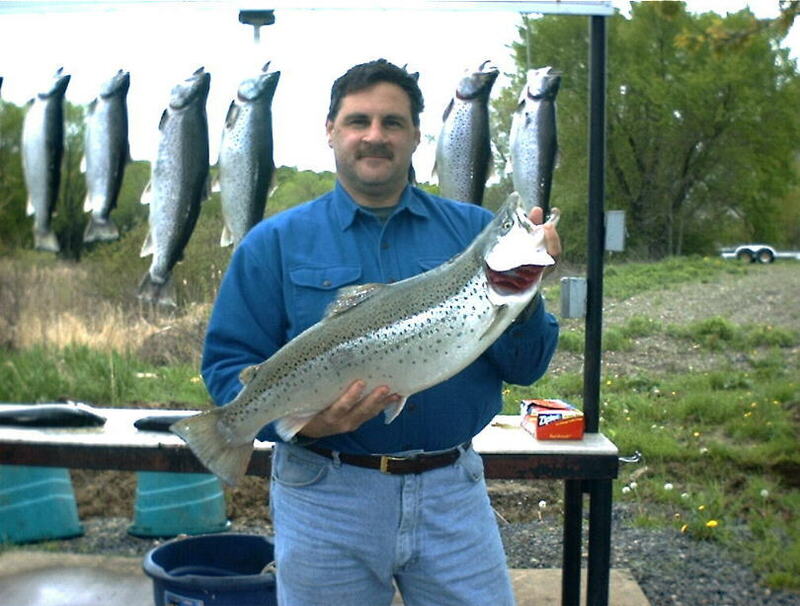 Rick De Gironimo caught his first trophy size brown trout (15+ lbs). 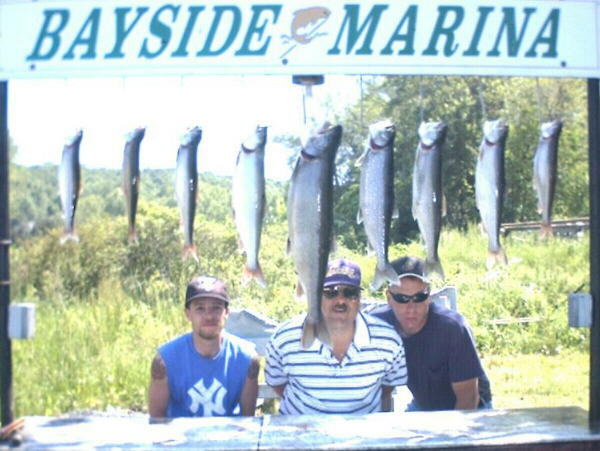 Paul Ranello had to settle with a triple header of three browns (10, 12, & 13 lbs). While Mark Ranello finished second with a 14 pounder. The three had a great trip. 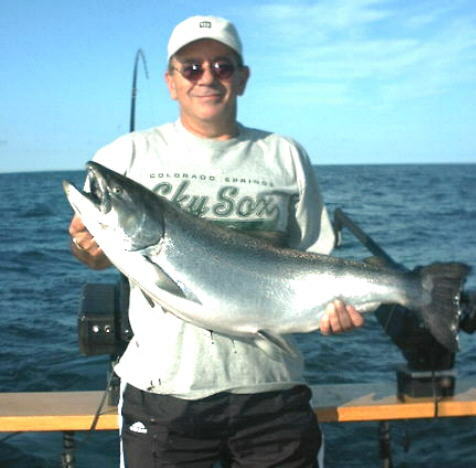 This 37 pound King Salmon set a new record aboard the Fantasy Charters for the time it took to land the fish. This feisty King took over 2 hours to put in the boat. The prior record for longest fight was 1hr 45mins. The faithful troops remained on deck drinking the beer and coaching while the fish was winning the war of wills.